Ken Lingenfelter's heart must be almost dangerously large given the number of cars that have a special place inside of it, from American muscle to the best sports cars Europe ever built and one extremely strange Corvette. What happens when you build a collection of 190 vehicles out of nothing more than love and nostalgia? Heaven. Every car collector you'll ever meet has an ethos behind what they do. For some, like Ralph Lauren, it's to collect the beautiful pieces to inspire. If you're the Sultan of Brunei, it's to have one everything that's worth anything and leave it to rot. 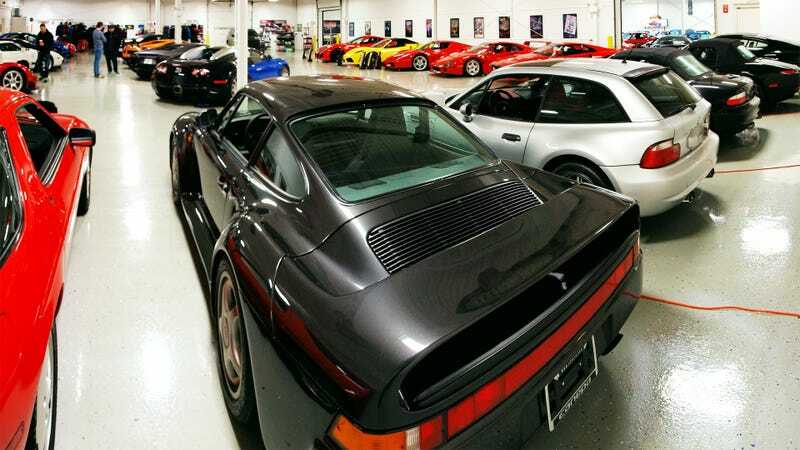 Ken's collection, much like Jay Leno's, is just his own history and taste manifest in a massive garage full of randomness. As he freely admits, there's stuff he buys that even his own employees and friends try to talk him out of that he nevertheless wants. An example, the Greenwood Corvette above. Take all of the weirdest '70s excesses of the C3 Corvette and stretch them out to almost comical extremes and you've got this car. Yet, Ken loves Corvettes and cares about Corvette history so this car had to take up space in the 40,000-square-foot museum. But to hear Ken explain the significance of this particular model and of the company it makes sense. Even with those ridiculous louvers. It's not my taste but Raphael clearly loved it as can be seen in these detailed photos. This love of GM products makes sense in the context of Ken's father, who worked at the Fisher Body company when it was predominately responsible for making the bodies for the higher end GM products. This included figuring out how to package the then revolutionary FWD Oldsmobile Toronado. Of course he has one. It's not all traditional American muscle, though. When Ken's charming wife Kristen first welcomed us into the nondescript warehouse outside of Detroit I have to admit my eyes first went to the Vector. I mean, who has a Vector? It's just so strange to see, especially parked next to an Audi. This is in what I'd describe as the European room, although it includes the aforementioned Vector and a Ford GT. Ken shares a last name and a distant familial connection to the John Lingenfelter who founded Lingenfelter Performance Engineering. Though Ken made his money in the real estate settlement industry, he has the manner and history of a lifelong car nut and purchased the assets of Lingenfelter Performance in 2008 and has carried the company's spirit forward. You can see this in the Firebird-inspired Camaro conversion kits they've worked on, and in that car's inspiration. The entire collection is structured like this, with cars thoughtfully spaced out with other vehicles that share a similar history or philosophy. This includes a great collection of 'Vettes from history. The Callaway Speedster above is a treat, as well as this rare prototype mule used by the Zora Duntov to test the use of a V8 in GM's first modern sports car. They later used this prototype for strange aerodynamic experiments. What does this have to do with the row of Ferraris or Alfa 8C on the other side of the building? Not much other than a passion for cars that's clearly a part of the family. Kristen, for instance, explained how she was anxious to get her C7 Corvette back now that they've fitted a new exhaust. What was wrong with the old exhaust? "Too quiet." Amazing. In the meantime they have a Ferrari FF to survive the winters. Though all the cars belong to the Lingenfelters, the other spirit guiding everything is generosity. While the collection isn't open to the public, the space is used more than 100 times a year as a location for charity events. On the day when we visited it was just on the invitation of Matt, who works at the collection. Nevertheless, Ken and Kristen donated their time and walked around telling stories for nearly two hours. He even started up his Enzo for us (that, too, had a custom Tubi exhaust). In the time we were there we barely scratched the surface of Ken's insights or his collections and I'm definitely angling to get back. They've got a nice list of cars on their website, as well as a list of upcoming charity events. If you've got the means and the time and are in Michigan I can't comprehend why you wouldn't go. Where else are you going to see a Bugatti around the corner from a "clownshoe" BMW M Coupe within throwing distance of a Tojan Nightmare? All photos Copyright Raphael Orlove/Jalopnik, Special thanks to Matthew, Ken and Kristen.